"Hola! I'm Ileana, and this 'Tica' (native Costa Rican) is happy to meet you. 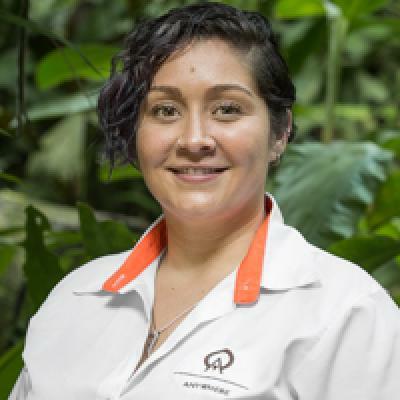 I was raised in Monteverde — surrounded by nature, and living the authentic Tica lifestyle. I've been a travel professional since high school, and I now have nearly a decade of experience in the field! I love how my career has helped me meet people from around the world, and make new friends within my home country. Honestly? It's a joy to help families travel throughout the country and experience the best that Costa Rica has to offer. My favorite memory is when I helped a couple plan a simple vacation, and they ended up eloping! It started with a few phone calls, and they soon informed me that they were getting married in Costa Rica. Why not make things easy on and turn your dream vacation into your dream wedding and honeymoon, right? Soon, they arrived in Costa Rica, and we helped them get married in Manuel Antonio — one of my favorite places in Costa Rica. I try to go to my favorite destinations as often as possible, but the truth is, I feel blessed to live in beautiful La Fortuna and enjoy views of Arenal Volcano from my home. If you'd like, I can help you find a hotel with a similar view when we book your trip; and yes, I can even help you plan your wedding ;-)"
Once again thank you very much Ileana for organising our dream holiday PURA VIDA! Thank you so much! You have an incredible team and you made sure my boyfriend and I had the most amazing vacations in Costa Rica, a unique country that should be on everybody’s bucket’s list!! Thank you for this experience!! The trip was fantastic! Every step of your organization was on point - from the type of accommodation, to the taxi service, to the tours! We could not have done this trip without you! Thank you so much! Ileana was the most pleasant person I ever had the joy of working with. I hope that she can help us again in the future, for another vacation. Very helpful and smooth vacation with everything planned ahead of time. Tours and tour companies were excellent and professional. Would use Leanna again in a heartbeat! Our agent revised and revised until everything was perfect for our trip. Fantastic job!!! You did an incredible job planning our vacation and always placing my mind at ease. I did not have time to plan this trip and do research, and honestly everything you suggested was just perfect. Thank you so much-- you do an amazing job! My husband and I now have new, wonderful memories, thanks to you! Great service - friendly and informative. Everything we wanted taken care of. Such an AWESOME trip! We have recommended anywhere.com to lots of people. One of our best trips ever!!!!!!!!! Ileana answered all my emails and questions in a timely manner. She was very helpful in organizing our transportation and tours. It was wonderful working with Ileana!! All your recommendations were perfect, including the restaurants you mentioned. Thank you for all your help! Ileana is very responsive and knowledgeable!! Great! I did work with a couple different people along the way in planning the various portions of our itinerary and everyone was very helpful.